Bullfrog Spas provides hot tub to help swimmers warm up during the Polar Plunge, a benefit for the Special Olympics. You can see it is just a big party atmosphere. People love to come out, and it is our community that makes this such a success. Bullfrog International, manufacturer of innovative hot tubs, is proud to sponsor of the 2012 Polar Plunge, a benefit event for the Special Olympics. The event, which took place earlier in the month, encourages brave swimmers to leap into icy waters for charity. This year's Plunge was held at Pelican Bay Marina in Saratoga Springs, Utah, and was organized by the Saratoga Springs Police Department. 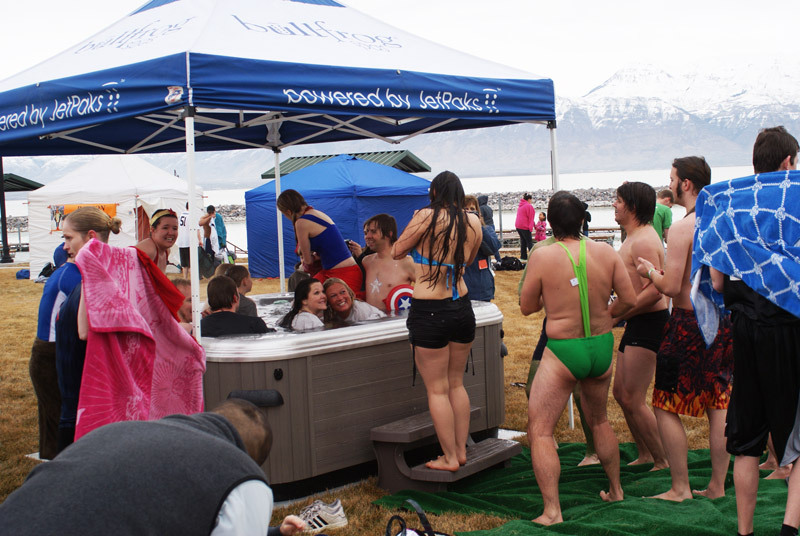 Bullfrog Spas provided a Model 662 hot tub heated to around 100° F to help participants warm up after their brave swim. As can be imagined, the warm portable spa was an especially welcome addition to the event. Both individual participants and teams worked to gather pledged donations in support of their willingness to jump into a frigid lake. The event helped to raise over $16,000 for Special Olympics of Utah. Smiles everywhere showed that this was a fun event and a great cause. Local eateries donated donuts and hot dogs to both jumpers and participants and a local coffee shop donated free, and much needed, hot coffee and hot chocolate. Ed Christiansen, of the Saratoga Springs Police Department, organized the event. "What we love most is teaming up with Utah Special Olympics and their athletes, and having an opportunity for our citizens to get involved," Christensen said. "You can see it is just a big party atmosphere. People love to come out, and it is our community that makes this such a success." One of the favorite features of the event was the costume contest. Teams and individuals donned attire ranging from superheros, to penguins, to Hawaiian dancers. The Boys in Pink won the costume contest with their pink tutus and coconut bras. Chain saws were used to create an opening in the ice. This was Bullfrog’s third year sponsoring the event and the Bullfrog Spas Model 662 hot tub was a great hit once again. This 6-person hot tub was often overfilled with appreciative swimmers needing a warm-up after their swim. For more information on Polar Plunge events and the Special Olympics visit http://www.sout.org. For more information on Bullfrog Spas visit http://www.bullfrogspas.com.